Combine cream cheese, mayo, onion, and olives. Mix and spread a thin layer on shells. 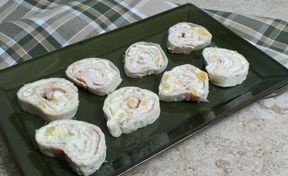 Sprinkle cheese on the cream cheese layer then arrange layer of ham. Roll up. Wrap in plastic wrap and chill at least 3 hours. Cut and serve. Good served with salsa to dip them in.